Recent studies have also linked periodontal disease to increased risk of heart attack, stroke and other serious diseases. Smoking can also affect pint-sized patients who inhale the cigarette exhaust that others puff into the air! A recent study published in the Journal of Clinical Periodontology takes the first look at the influence of passive smoking on the oral health of children. Researchers compared children whose parents smoked with kids whose parents did not. 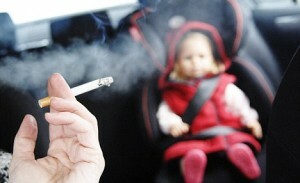 The study’s findings revealed that smokers can indirectly harm the oral health of their children! Researchers measured saliva for levels of the chemical cotinine, a major product of nicotine processing, in the body. Cotinine generally stays in the body longer than nicotine. The level in one’s saliva correlates with that in the blood. Children who had been exposed to parental smoking had greater levels of the substance in their saliva than the children whose parents were non-smokers. What’s more, youngsters who had higher saliva levels of cotinine also fared worse on oral dental exams. Nicotine addiction is a tough habit to break. So if you do smoke, be thoughtful of others and never smoke near children. Obviously, compared to cancer, cavities may seem almost insignificant, but painful tooth decay in children can distract them from their studies, can lead to the loss of permanent teeth or systemic infections and even, in rare cases, death. Cavities in baby teeth may also lead to long-term problems in adult teeth. That said, parents and grandparents, next time you need motivation to stop smoking...think about your kids’ and grandkids’ teeth. Give them something to smile about...your health, and theirs.